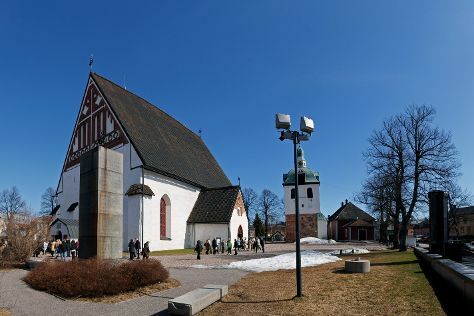 On the 29th (Mon), admire the natural beauty at Ainola - The Home of Aino and Jean Sibelius, get some fabulous bargains at Brunberg Candy Factory Shop, then contemplate in the serene atmosphere at Cathedral of Porvoo, and finally make a trip to Porvoo Old Town. Get ready for a full day of sightseeing on the next day: contemplate the long history of The Runeberg Home, then explore the striking landscape of Haltia - The Finnish Nature Centre, then take in the spiritual surroundings of Espoo Cathedral, and finally admire the masterpieces at EMMA - Espoo Museum of Modern Art. To see traveler tips, more things to do, reviews, and tourist information, read our Porvoo day trip planner . If you are flying in from Belgium, the closest major airport is Helsinki Vantaa Airport. Expect a daytime high around 10°C in October, and nighttime lows around 1°C. Finish your sightseeing early on the 30th (Tue) so you can travel back home.